GI refers to the glycemic index. It’s specifically used to keep your blood glucose levels stable to help you ward off type 2 diabetes, or for those with diabetes to follow. The glycemic index is literally a list of carboydrates that are rated within a scale of high, moderate or low GI. Where they sit on the scale depends on the way they affect blood sugar levels. The higher the GI, the more the food will effect your blood sugar, and the lower the GI, the less the impact on your blood sugar levels, and the better for you. 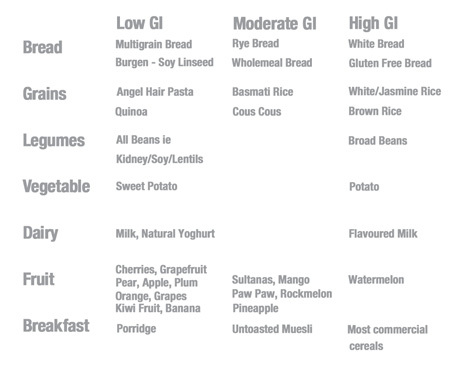 So the idea is to swap the higher GI foods for the lower GI alternative. There are two considerations when looking at the GI diet. The amount of carbohydrate (sugars and starches) in food is important to understand so we can make an informed decision on what, and how much, we should have to keep us healthy. The carbohydrates we consume are broken down by our bodies and made into glucose. The glucose is released into our blood stream. Our body then creates a hormone called insulin. Insulin takes the glucose out of our blood and allows the glucose to be stored into our cells to be used as energy now or for later. Without insulin, the glucose cannot leave our blood and enter our cells. Therefore the glucose is stuck in our blood stream. Diabetics either don’t have enough insulin, or their insulin does not work effectively. The point of a low GI way of eating is to fight against lifestyle preventative diseases such as diabetes. Through this way of looking at the way we eat and exercise, I’ve got more energy, a clearer mind, have lost weight, and am actually really loving the food. Free Foods – Do not effect your blood sugar, and are healthy to eat, these include all other vegetables, strawberries (most berries, actually), cheese and proteins such as lean chicken, beef, lamb etc. Ultimately the focus is on food that hasn’t been processed, and is as close to the original source as possible. And choose organic when possible. Swapping the High GI foods for the Lower GI will help, as well as limiting your portion sizes of things like pasta, bread, and dark chocolate. I found it easiest to compare the “Per 100g” amount of carbohydrates on the back of packaging. Serving size varies so much per product type, and it can be incredibly confusing, so if you’re comparing different choices like which bread to buy, check out the “Per 100g” column and go with the lowest amount of carbohydrate per 100 grams. But do be aware of how much of that product you’ll be eating as a serving size you dish up could be much more than 100 grams. A moderate amount of low GI carbohydrates are important with each meal and snack. Carbohydrates are an important element of a balanced diet, and help to keep your blood sugar levels stable. Sweets, biscuits, fruit juice, sauces, soft drinks, fruit juices, cakes, pastries etc are High GI with little or no nutritional value. Steer clear of packed, refined grains, refined sugars, processed, preservative and chemical laced foods. If it comes in plastic or in a box, the nutritional value is generally terrible! However there will be certain packaged foods that you eat, like bread, so how do you make the better choice? Looking at the nutritional information tables on the back of packets can be very confusing, especially when it comes to serving size as they vary depending on the product. I always look at the column that refers to the amount “per 100 grams”, and then choose the lowest carbohydrate value. This way, you’re looking at the same measurement across the board. Chopped vegetables like carrot and cucumber, homemade dips, unsweetened full fat yoghurt, low GI fruit (not watermelon), a piece of low GI bread, unsalted, eggs and cheese. Fat does not directly affect your GI levels. But consuming too much saturated fat can affect your health and therefore affect the efficiency of your body and then your GI levels. Healthy fats like olive oil, avocado, unsalted nuts and lean meats are awesome, and a great source of nutrients for you. Be careful of products marketed as low fat. It’s important to see what the product is replacing the fat with, as the manufacturer is usually trying to keep it tasting similar to the full fat version. For example, many yoghurts that are fat free replace the fat with sugar, so low fat is not a healthier option. Go for the full fat option, it’s less processed, and the reality is the fat content is less harmful to your body than the sugar. I’m all for having full fat rather than the low or no fat options if it’s really just a high sugar alternative. If it’s got added sugar it’s not a healthy choice, it’s a sugar filled treat. The biggest and best way to keep your body healthy is by eating as close to the original source as possible. Raw, organic and fresh! Fruit, vegetables, dairy and lean meat, with the majority of your plate being vegetables. It really is about changing the way food and you work together. A small amount of chocolate (swapping milk chocolate for dark 70-80 % chocolate is a great start) or eating berries, or changing up sugar for other ways of having your dessert fix. It will take time, but slowly you’ll start to slow down the cravings for sugar and discover how sweet the taste of more natural foods can be. Artificial sweeteners are not a better option either.